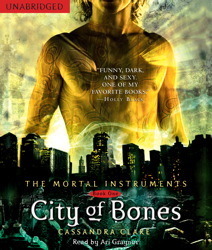 Summary: When fifteen-year-old Clary Fray heads out to the Pandemonium Club in New York City, she hardly expects to witness a murder—much less a murder committed by three teenagers covered with strange tattoos and brandishing bizarre weapons. Then the body disappears into thin air. It’s hard to call the police when the murderers are invisible to everyone else and when there is nothing—not even a smear of blood—to show that a boy has died. Or was he a boy? Review: I wanted to give this series a try as it is very popular. I watched the movie when it came out and have been watching the Shadow Hunters TV show on Netflix. Clary seems whiny on all platforms. And hearing her voices narrated made me cringe as the narrator captured the whiny-ness. The “twist” was already ruined for me (well, I ruined it myself) as I already saw the movie. The world building was good and the other platforms helped me create the visual in my head. I think if I was to read the book myself I might have different views on the characters as my voice/narration may be different than Ari Graynor’s. Currently, I’m definitely liking the Infernal Devices trilogy/prequel better than this series. But I am enjoying the world that Cassandra Clare has created. It wasn’t overwhelming to get into and I can understand everything that is going on. At this point I don’t know if I’ll continue with the audiobooks or not. To be honest this could’ve just been left as a stand alone. This entry was posted in audiobook, book review, Cassandra clare, mortal instruments, review. Bookmark the permalink. Aw, so sad to see this got a 2.5 rating! I think that if you plan on continuing the series, you should try the books better. Yes, Clary is whiny and annoying, book or audiobook or movie or tv show, but believe me, everything gets better through the next two books! I've only read the first three, so I can't talk much about the series in general,=, but it's really, really, enjoyable so far, and Cassie's writing is amazing! So yeah, if you plan on continuing it, I hope you get to enjoy it! And if not, don't worry about it, enjoy the Infernal Devices instead!